Trust Honeysuckle Nursery and Design to design and build the perfect spring hardscaping features for your home! No matter what design you have in mind, you can achieve it. Even so, you should probably make sure it will blend well with the rest of your home’s exterior – a poor combination can be off-putting rather than pleasant. Maybe you’d like fire features and water features, such as a fire pit and a pond, to create a sense of contrast. Or you’d prefer to have brick paths and low stone walls perfect for sitting on. The choice is yours! Your hardscape features can protect the rest of your yard from torrential spring rains. So, make sure you think about drainage when you are outlining your plans for your Ellicott City hardscapes. Although you might think a straight line is the quickest path to a beautiful Ellicott City landscape, straight lines everywhere isn’t always natural. Twists and turns can be just as fun to spend time in when you’re spending more time outside this spring. Don’t be afraid to consult professional advice. Here at Honeysuckle Nursery and Design, we are committed to helping you get the look that you want. Not only should you get in touch with us, but you may need to determine the proper building codes for updating your lawn. 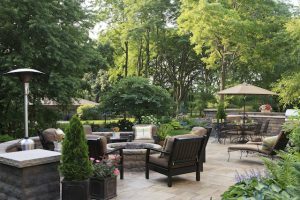 GET YOUR LAWN, GARDEN, AND HARDSCAPES READY FOR SPRING WITH HONEYSUCKLE NURSERY AND DESIGN! This entry was posted on Friday, March 16th, 2018 at 10:51 am. Both comments and pings are currently closed.